It’s natural that you might have a range of questions on worktops – our experienced team has the expertise and knowledge to help you out with almost any query regarding your new worktops. Here are some of our most frequently asked questions but if you can’t find the answers you are looking for, please don’t hesitate to contact us for more information. Granite is a natural, hard wearing material formed from molten lava over billions of years and mined from the ground. It’s ideal for kitchen worktops. Quartz is a man-made stone which is made from ground-up quartz and mixed with resins. The resulting combination makes Quartz an extremely hard-wearing material which is resilient to most staining. Every worktop is bespoke, meaning no two are the same. From start to finish our bespoke worktops typically take 7 days from agreeing the template to completing the installation. However, we never rush a worktop as we want to be sure that you love it and that it exceeds your expectations. A template is an exact replica of the required worktops. Taking all accurate measurements of the kitchen units and cut outs for hobs, sinks and taps etc. Along with the shaping and overhang required. This is then used to manufacture the worktops, ensuring a precise and accurate cutting of the granite for a perfect work surface installation. 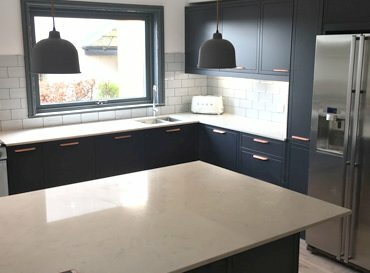 How do you template my worktop? For the best quality and service, all our luxury worktops require an initial template that takes place once the cabinet units are in situ. Do you offer a template and fitting service? A full template & install will be included in your quote and to get a true template we do advise existing worktops are removed. We do not need any sinks to be in place although any appliances, sinks & taps should be on site for template. We advise that you do not change the design of your kitchen or any cut-outs after the point of template. If you do this will result in a re-template which will be chargeable. Our worktops have a smooth, non-porous finish which means water, bacteria and mould cannot penetrate the surface. The seamless finish of the worktops means they will look brand new in years to come with no issues such as grouting. Can you see the joints? Where 2 solid stone worktops meet a visible join must be formed, however these are treated so that they do not detract from the overall beauty of the worktops. Can I put hot pans directly onto my worktop? Although Marble, Granite and Quartz are very resistant to high temperatures avoid placing anything hot directly onto the worktops as this will slowly damage the material. Always use pan bars or trivets to protect your worktop. Is my worktop covered by a warranty? We offer at least a 10-year manufacturer’s warranty on all our worktops and a 12-month installation warranty. How do I clean my worktop? What can harm my worktop? Worktops should not be brought into contact with strong acids or chemicals including paint stripper, brush cleaner, oven cleaner, nail varnish remover, degreasant or similar products. Along with Abrasive materials and Hot items. What is the turnaround time from template to installation? We offer a 7 day turn around on worktops, which is typically quicker than most other suppliers. There are a few conditions to enable us to achieve this, but nothing too onerous. Find out how much a bespoke marble, granite or quartz worktop will cost in your home. With every worktop created for your home, no two worktops are the same. Granite has endless variations, versatility and is renowned for its toughness and durability. At Henley Granite & Marble we work with you to create a granite worktop that’s perfect for your home. As every Marble worktop is created specifically for you and your home, we take time to understand your requirements and those personal touches that make all the difference. Add a luxurious finish to your kitchen with a stunning Quartz worktop. 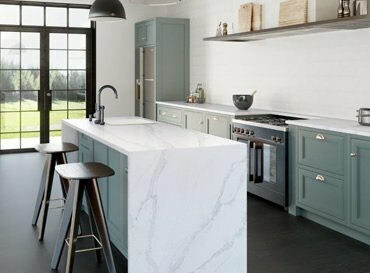 Quartz combines the natural beauty of stone with all of the benefits of technology. We are over the moon with the worktops and the table supplied from Henley Stone Specialists. The service we have received has been brilliant from our initial contact with Jon and Steve to finally Lee and the other installers. The price was very competitive and the quality 5*. Everything from quote to order and finally install has run like clockwork and the lead times very short too which worked really well for us. The mess was minimal and Lee and the installers were very friendly and really went out of their way to accommodate us from removing our existing worktops to arranging for an addition to our original order by suggesting you could do a matching table. I was unsure what the table would look like but Lee assured me it would look good and he was absolutely right it’s amazing and handmade which has turned a plain table into a unique one off piece of furniture. We will definitely be recommending you to our family and friends and would without hesitation use you again! Thanks to everyone involved! 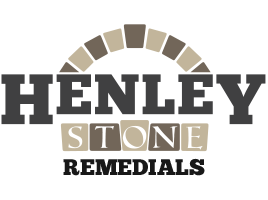 I contacted Henley Granite & Marble after seeing the quality of their products and services recently at a close friends property. Having stopped by their offices in Wakefield, I immediately received a warm welcome and felt at no times under pressure to commit to anything (which is refreshing). We were initially, unsure of the material we wanted but knew how we wanted the finished kitchen to look. Kirby, was our POC and talked us through the various worktop examples she believed we were envisioning and kindly allowed us to take samples home under no obligation to see how they would complement our decor. Once we selected our worktops, Kirby maintained fantastic communications and support throughout, whilst we completed the final phases of our home renovations. The design and Installation team then came straight down to template and install - all within 1 week, leaving our property clean and tidy. From start to finished, they have collectively provided a fantastic service and we are absolutely delighted with our worktops and kitchen. We would have no reservations whatsoever in recommending Henley Granite and Marble to family, friends & others. I would like to say how unbelievably happy I am with the excellent service & customer care I have received from Henley’s but especially Steve & Kirby, They are both a huge credit to your company and nothing was too much trouble to them as were the rest of the team who were very polite and helpful when my work surfaces were getting fitted last Monday. I will recommend Henley Granite and Marble to friends and family. 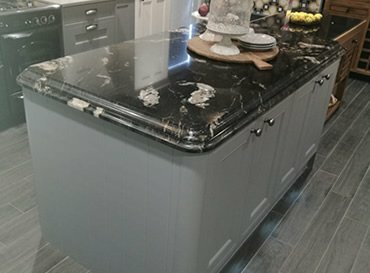 We bought our Granite kitchen worktop from Henley Granite and Marble, We are delighted with what they have done for us. The lads (Lee & Aiden) were phenomenal & fitted the worktops in very little time. 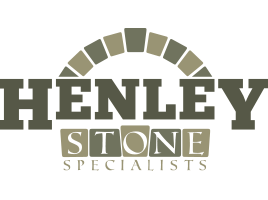 The overall service from Henley’s was superb & the product is the best. Thank you to Shaun & Jon Henley, & to Lee & Aiden for everything. Top lads, Top product, Excellent all-round!! Recommend them to everyone, Anytime. Are the go to company for the installation of all Stone, GRC, Brick & Blockwork requirements, our award winning commercial and residential developments have made us the only company required for many esteemed and high-end developers. Are utilised by anyone requiring any Stone, Brick or GRC Repairs, Cleaning or tinting. With a varied customer base from large commercial companies to residential properties.